National People’s Party (NPP) on Monday paraded leaders from its alliance partners including Tourism Minister Metbah Lyngdoh, Education Minister Lakhmen Rymbui, Revenue Minister Kyrmen Shylla, MIDC chairman Renikton Lyngdoh and host of other leaders at different election meeting under South Tura, where Meghalaya Chief Minister Conrad K Sangma is seeking the mandate of the people. 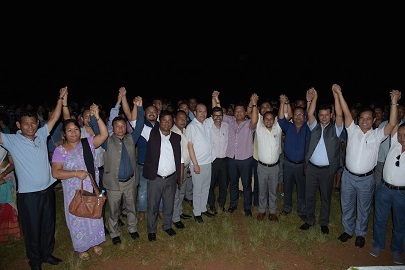 Manipur Deputy Chief Minister Yumnam Joykumar Singh and National Youth President of NPP, Ratika Yumnam also attended the election meeting at Fancy Valley locality under South Tura to drum up support for Conrad K Sangma. Manipur Deputy Chief Minister Yumnam Joykumar Singh said that the byelection was very important as this would send a message to the Centre that Conrad K Sangma is a deserving leader of the region. 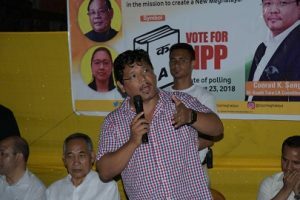 “Conrad Sangma’s victory with a huge margin will further strengthen the coalition government in Meghalaya. It would also send a message that the current government has control over Meghalaya and would further support the State to ensure growth and development,” added Manipur Deputy Chief Minister. “My association with Conrad Sangma and his family has been for a very long time. I am there to support him and invite each and everyone to support Babang (Conrad Sangma),” Lyngdoh added. Shylla, youngest minister in Meghalaya Cabinet had won the February election with a margin of 8000 plus votes.